Microsoft took the next steps necessary to broaden the adoption of its PowerBI business intelligence tool, adding mobile apps along with a free tier. About a year ago, Microsoft launched PowerBI as part of its Office 365 service. PowerBI was pitched it as a way for the average professional to analyze a company's real-time data, so they could see which products were currently selling well in certain geographies, for example. Microsoft limited PowerBI to certain enterprise plans and charging about $13 more per user, per month for the service. Now, Microsoft has expanded the capabilities of PowerBI, while slicing the price, as part of a new "preview version" of the app. Microsoft also launched a free PowerBI app for the iPad, and said that a similar Windows universal app would be launched later this year, as well as versions for Android and the iPhone. Microsoft's new PowerBI preview will be available across a variety of platforms. Microsoft also said that it would cut the monthly price of the existing PowerBI service that's already in the market to $9.99 per user, per month. When the "new" PowerBI formally launches later this year, it will be available for free as well as in a "Power BI Pro" tier, available for $9.99 per month. 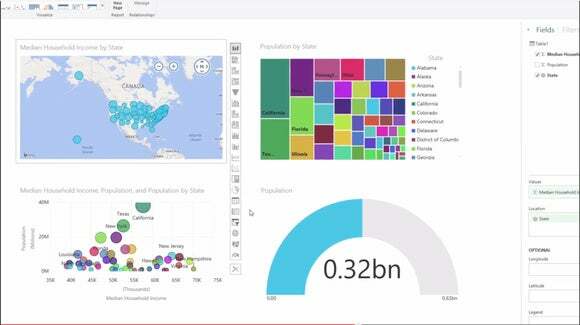 The idea behind PowerBI is to connect as many as data sources as possible, and configure them in such a way as to make the interpretation of their data simple and visual. While it's difficult to see what's changed visually, Microsoft said that many new data sources have been added, including GitHub, Marketo, Microsoft Dynamics CRM, Salesforce, SendGrid and Zendesk. More are coming in the next few months, including Inkling Markets, Intuit, Microsoft Dynamics Marketing, Sage, Sumo Logic, Visual Studio Application Insights, and Visual Studio Online, it said. PowerBI also ships with a new tool, called PowerBI Designer, that allows data analysts at companies that have them to design their own custom data views for other employees at the company. PowerBI hopes to hook customers in three ways: as a source of live data that can be used in a report, rather than information that's already out of date; with location tools that can map data onto geographies or cities; and a Q&A tool that allows users to ask questions of the data, like Microsoft's search engine, Bing. There's only one catch: To try the free preview, you'll need to enter your work address, not your personal email. While the new PowerBI free tier will certainly help disseminate PowerBI into the workplace, only the paid tier includes all of the PowerBI magic—namely, a live, interactive connection to data sources. Also, the data sources will only update daily using the free service, and hourly using the paid tier. Given those limitations, the flexibility to parse the data in different ways (as the Microsoft video below shows) likely won't be available for the free tier, either. Otherwise, the pricing model that Microsoft published more fully describes the difference between the two plans.